The kitchen is the place to which we must pay the greatest attention to keep it impeccable. Do not forget to call us for an apartment cleaning chicago and for a incredible maid service. The following secrets will provide you with an elegant kitchen. Use a sponge moist with water and a little vinegar or baking soda. 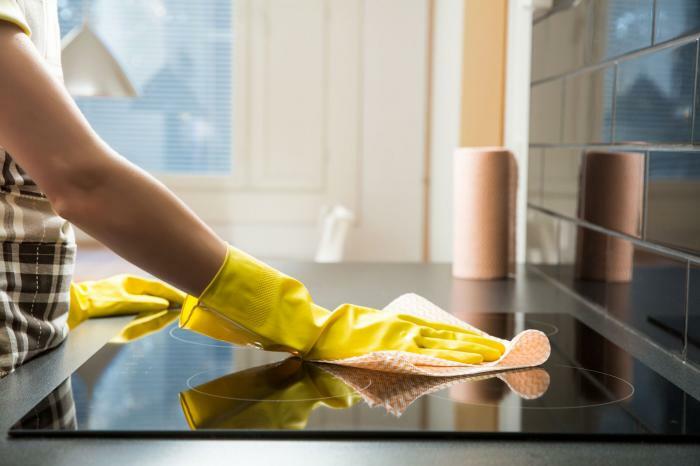 To clean the stove and oven you may also use a sponge moist with water and baking soda, add just a few drops of lemon. Remove the excess with a damp cloth or towel and procced to dry with a clean cloth. Empty the refrigerator and freezer completely, preferably once a month. Check that the expiration dates of the products have not expired. To clean, start from top to bottom carving and removing stains using soapy water. Dry well with a cloth. Don’t forget to also clean the drawer compartments and the outside of the refrigerator. A tip to eliminate bad smells is to always have a small box of open baking soda in a vacant space in the refrigerator. Another option is to place an open jar with fresh ground coffee beans or a branch of vanilla in one of the top corners. To wash your dishwasher, remove the filter and wipe it with a damp cloth. Remove any remaining soap or food. Then put a splash of water with vinegar in the soap container and put your dishwasher to work without dishes. Remember to change the filter periodically. A tip to clean the microwave is to place in a container filled with water and the juice of a lemon; put this mixture to heat in the microwave for 3 minutes. This is a way to eliminate odors and remove dirt easily with a clean cloth.